The Asian tiger mosquito is very distinctive looking. It is jet black with white stripes on its legs and head. It is unique because it will only breed in artificial man-made containers. These mosquitoes were first collected here in 1996 and since have spread throughout the county. These mosquitoes are very aggressive biters and will come out anytime, day or night. All of us have a tiger mosquito habitat around our homes. We can greatly reduce the population of the tiger mosquitoes only by physically removing these items permanently or emptying them every week. Once the eggs hatch, the juveniles (larvae) are like fish. They need water to survive. If we remove or empty these containers of water, the larvae can never become biting adults. Truck sprayings are not effective against tiger mosquitoes unless we remove their breeding sites. Please help us control these pests. 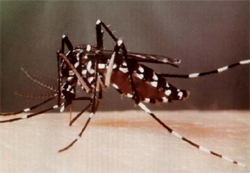 If you would like more information concerning Asian tiger mosquitoes, contact us at 410-535-6924 or email us.